Eversendai or Sendai for short is another popular stock in the Malaysian stock market. Let's take a look at its technical picture. I'm just going to look at the technical picture, so you will need to do the fundamental analysis yourself. Part of the reason why the stock ran up recently is because of the buying interest by Koon Yew Yin. He is quite transparent with his purchases and frequently blogs about it. When you have buying interest by a famous investor in a country it often generates a lot of interest and some people may follow and buy the stock as well. Usually stock prices can go up 10-50% when a large investor buys a huge position in a stock. Technical analysis does not apply for large investors as their buying might cause the price trend to change. It is earnings, and potential future earnings that attracts them to buy the stock in the first place. If I know a semiconductor company that is going to grow its earning 50% per quarter for the next 6 years, I will accumulate and accumulate and accumulate the stock non stop every month for the next 5 years. I don't even need to look at the technicals in this case until the end of the 5th year. But anyway, our purpose is to look at the stock from a technical point of view so let's have a look at what the chart is doing. 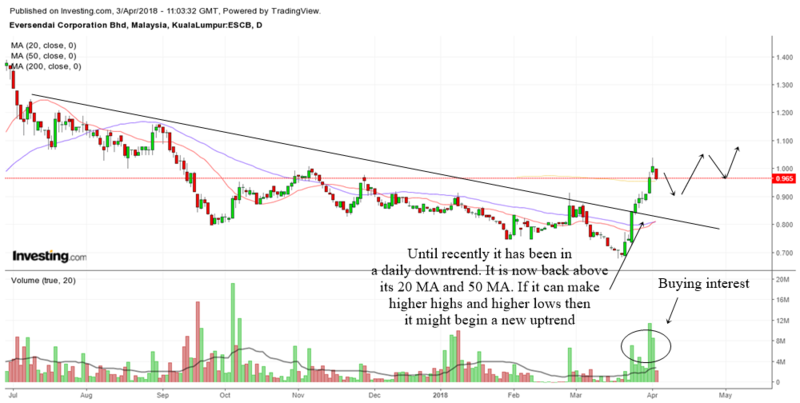 The stock recently broke a daily downtrend line. It has been in a daily downtrend for quite a long time. The fact that it breaks above a downtrend line and breaks above the 20 MA and 50 MA shows us that the stock may be changing trend from downtrend to uptrend. That is a first good sign. Of course do remember that the recent surge up is because of buying interest by KYY. The volume that I have circled shows the buying interest by investors. Usually experienced investors are correct as they would have down their homework before putting millions into it. If the stock can continue to make higher highs and higher lows in the daily chart then the stock will likely to move up and make a nice new daily uptrend. Let us now look at the monthly chart to see what is happening. 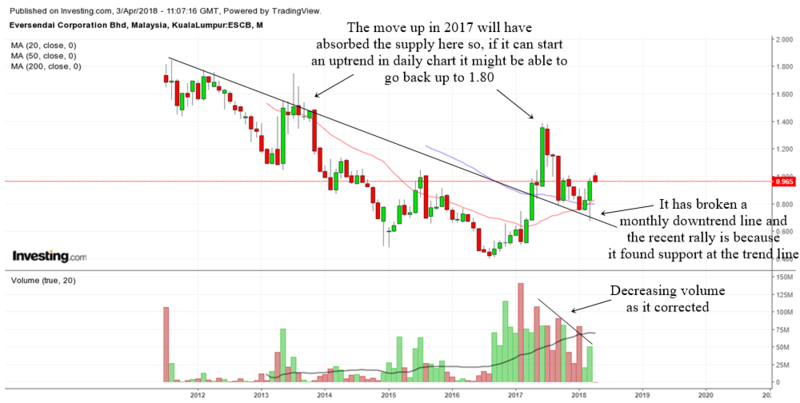 The stock has broken above a monthly downtrend line. You can see how the recent bounce up found support at the trend line. This is another technical concept. Trendlines can be support areas once broken. It rallied very fast last year but collapsed as it hit resistance. That is normal as the amount of supply from the left needs to be absorbed before the stock can go up once more. Now that the supply may have been absorbed by the bull run last year, if the daily uptrend materializes the stock just might be able to go back above 1.80. It might take some time though. The declining volume as it corrected from last year is also another good sign. Well, that is the TA for this stock. In the end it is up to you whether to invest in this one or not.